"Legal and Policy Aspects of Space Cooperation in the BRICS Region"
The BRICS countries - Brazil, Russia, India, China and South Africa, all being developing countries, grouped together and formed a flexible political and economic bloc in 2009. This provides a platform for these five countries on which to coordinate and cooperate on various issues. While space activities are not specifically mentioned in the area of cooperation, the open and flexible nature of the platform does allow for intra-BRICS space cooperation, of which bilateral cooperation is the main future. 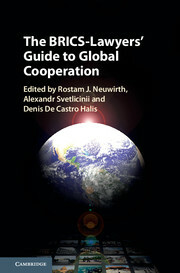 This chapter then analyzes the reasons for the current situation and identifies the difficulties and barriers in carrying out multilateral cooperation among the BRICS members. It concludes that the widely accepted principle of space cooperation also applies to the BRICS and then that more efforts are needed to realize the wider scope of space cooperation among the members.